K-PAX Racing's attempting to turn an off-the-line Volvo C30 into a world-beating race car in 60 days. Driver Robb Holland's going to give us weekly project updates. Part Six: a shocking revelation. —Ed. We're in the homestretch now. We can see the light at the end of the tunnel and as long as it's not a train coming in from the other direction, we are looking good for having the first C30 done and out the door for dyno work and testing. As cool as you guys think it is to read about this, it's far cooler for me to walk into the shop and, instead of seeing a chassis and random car parts, there's actually something doing a pretty good impersonation of a racecar sitting in the middle of the shop floor! As a driver there's nothing more exciting than breaking in a new, zero-hour racecar, especially one that you helped plan/design and was built by last year's champs. Now that we're rolling, go-fast goodies have been showing up on our doorstep like Charlie Sheen after last call. The latest box to show up is a rather heavy box from the Netherlands. Outside of some stylish looking wooden shoes, the only (legal) thing that could be coming in from my Dutch namesakes would be from the boys at JRZ Suspension. Last week, you may remember, I went off on how important the diff was in getting a racecar to work well. It is, but this week I'm going to add a corollary to that rule (quit your bitchin', these are my rules and I can change ‘em if I want to). The reason for the corollary is that in World Challenge the one area that is totally open (with regard to the rules) is shocks. As long as your suspension is the same type as the original car and mounts in the same locations, you can run whatever shock your little heart desires. Any time you say open rules to a race engineer, they start salivating like Pavlov's dog at a Presbyterian bell choir festival (it's quite embarrassing, really). With the open rules, 2-, 3- and 4-way adjustable, racing coilovers with remote canisters, from companies such as JRZ, Ohlins, Moton and AST are the mack daddy in Touring Car competition. Quick explanation: A 2-way adjustable shock (in our case a strut) is usually the bare minimum standard for pro level racing. While all coilovers are adjustable for ride height, a 2-way adjustable coilover is additionally adjustable for both compression and rebound. Compression controls the rate the shock compresses under load and rebound controls how quickly it returns to its initial state. Three- and 4-way adjustable shocks adds both high and low speed adjustability to compression (3-way) and compression and rebound (4-way). High and low speed here don't actually refer to the speed of the car but instead the speed of the shock. High-speed adjustability affects bigger events when the shock is moving quickly, regardless of the speed of the car, such as on rough or bumpy surfaces or curbing. Low speed adjustability works mainly to control the shock during corner transition, and also with braking and acceleration forces. On a basic adjustable shock there would be, maybe 6 to 8 "clicks" of adjustment for compression and rebound. On our super whammy, 3-way adjustable JRZ's, we have a range of 21 "clicks" of adjustment on high-speed compression and rebound and 12 "clicks" on low speed compression. Although we have a higher number of "clicks" the dynamic range of adjustment is still the same, however it does give us a much finer resolution within that range to tune the shock to the car and track on any given day. With the top ten cars most likely only separated by .5 seconds at St. Pete, every little advantage will make a difference. The last piece of our pro level shock package is the remote canister. 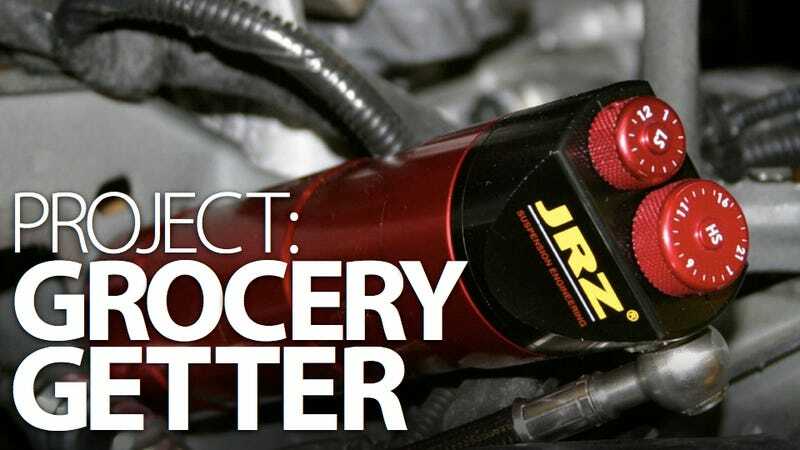 A remote canister coilover shock adds a gas-pressurized canister away from the body of the shock and has several advantages over a standard coilover. The main advantage is that you get a much bigger gas volume using a remote canister. This is important, because with the shaft diameters used on a racing shock, the higher gas volume gives you a lot more control over what you can do with shock compression. Secondly, remote canisters have the compression adjustment knobs located directly on them and because there is flexibility in the canister placement, it makes accessing those knobs (to make changes during an on track session) substantially easier for the team. Lastly the gas pressure within each canister can be adjusted individually and used as an additional means of fine-tuning the cars handling. As a pro driver I'm required to have a better than basic understanding on how shocks work and what effect the various adjustments will have. However, I am by no means the final authority on all things that go bump. For that I asked the guys at Jalopnik to fly me out on an all expense paid trip to Amsterdam to visit the coffee shops and red light district JRZ factory and interview the head of JRZ, Eric Ras. They said hell no. So I had to settle for calling the head of JRZ USA, Bryan Hise. "A 3-way adjustable shock allows an engineer to get better control over the different modes of the car so you don't have to do catchall changes such as changing out springs and sway bars in order to get the car to handle properly. If you're dealing with something that's more bumps and curbs, like on a street course or Watkins Glen, you can control a lot of those motions with high-speed damping. When you're trying to control balance and chassis movement you can use low speed damping." "Street car adaptations are something that we've actually do quite a bit and you kind of learn the steps you need to take to get the desired results without too many headaches. However each car is different so it's always a challenge for a shock manufacturer. The shocks we made for the Volvo C30 were all custom as it's an all-new body/ chassis design which we hadn't worked with before and we had to get a bit creative on some of the parts." "There's always a compromise on what you want to do structurally with the shock and what you want to do characteristically with the damping. Fortunately working with the K-PAX guys we were able to have your engineering staff give us a pretty good damping curve to get out of the box with." "A lot of the basic characteristics come through from the racecar to the street car. What the car wants with balance front to rear, what it wants pitch wise, and how generally stiff things need to be in order to give the car what it needs to work well. From there you can design a shock for what the general consumer needs versus what a pro race team needs and make the adjustments as necessary. The adaptation strategy usually stays the same from application to application but making that transition work well comes with years of experience of making shocks for pro teams, club guys, and for the general consumer." Note: A shock dyno is a machine that compresses and extends a shock at known speeds and measures the forces produced by it. An attached computer reads the data coming off of the dyno and presents it as a force vs. shaft speed graph. A shock dyno also allows you to see the effects of your adjustments. You can adjust a shock's compression and rebound settings from full-hard to full-soft, which then will produce graph curves that show the effect of those adjustments. "If a team doesn't have a close relationship with a shock manufacturer or third party engineering company, it is paramount that a team has access to that data (shock curves). Especially in the Touring Car class, where everything is spec and you can't change aero, or tires or much else, so much of the lap time comes from making the chassis work. If you don't have the shock curves you don't know if your shocks are matched or balanced, or if there is a problem with one of the shocks. You also have no idea as to what each adjustment does. When you make one click of adjustment, was that equal to the last click you made or is it more progressive and therefore more (or less) of a change then you were expecting." Robb Holland is a professional racecar driver with K-PAX Racing and 3Zero3 Motorsports. When he is not racing in World Challenge, Holland works as a performance driving instructor and owns a travel company that takes US clients over to Europe to drive the Nurburgring. You can follow him on his Facebook page.